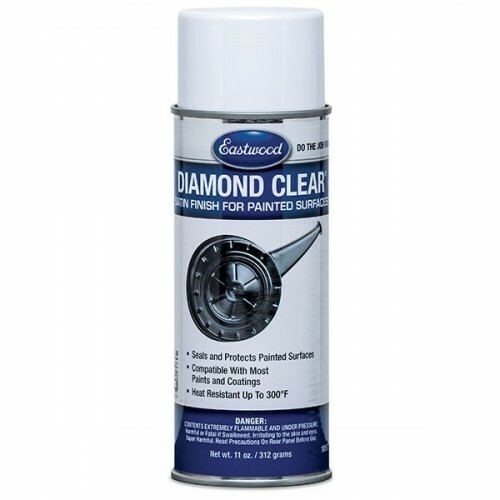 Diamond Clear™ for Painted Surfaces adds a semi-gloss/satin finish as it protects your vehicle's newly painted components. Use Diamond Clear™ as a top coat for most cured lacquer and enamel paints. Special low-sheen formulation won't offset the "soft" OEM-like finishes of detail paints. Polyurethane Diamond Clear™ formula provides a semi-gloss/satin finish that resists fading, chipping and cracking, and is compatible with most cured lacquer and enamel paints. One 11-oz. aerosol can covers 6 sq. ft. (or 2 to 4 wheels). May slightly dull polished metal surfaces.